If you’re planning on trading the U.S. retail sales report, then you should know that the headline figure for January is seen to print a 0.7% increase after coming in at 0.1% in December. Meanwhile, excluding automobiles, the core retail sales reading is anticipated to show a 0.5% growth during the month and erase the 0.2% contraction that we saw in December. Keep in mind that the report is the primary gauge of consumer spending which accounts for about 70% of the total U.S. economy. This is why almost all market participants are already looking forward to its release tomorrow (Tuesday, February 14) at 1:30 pm GMT. Economic gurus are optimistic about the upcoming report for a few reasons. One, they say that the strong NFP data for the month should translate to an uptick in consumer spending. Since people tend to spend more when they are employed, analysts anticipate that the 243,000 Joes and Janes who joined the job market in January opened their wallets for a little shopping. A few leading consumer spending reports also hint that retail sales were up during the month. For instance, according to the International Council of Shopping Centers, retail stores that have been open for more than a year (excluding Wal-Mart stores) saw a 4.8% jump in sales following the 3.5% increase in December. Thomson Reuters also reported that same-store sales grew by 4.2% during the month, more than double the 2.0% forecast. The surge in car sales has also gotten market junkies giddy. Autodata, publisher of technical charts for automotive professionals, reported that purchases of light trucks and cars reached an annualized amount of 14.1 million in January. FYI, this is the biggest amount we’ve seen since August 2009. Last but not the least, the need to replenish inventories during the month also must have gotten businesses spending. Business inventories rose by 0.4% and topped the 0.3% increase we saw in December. Now before you get too excited, you should know that the retail sales report has missed expectations in the last couple of months. Yikes! Looking at the past two releases, it’s also noteworthy to point out that the report had a direct correlation with the U.S. dollar, at least within the first few minutes after the release. In December 13, we saw November’s headline figure come in at 0.4% against expectations for a 0.6% growth while the core figure registered a 0.3% growth when analysts were eyeing it at 0.4%. Shortly after the release of the worse-than-expected report, EUR/USD rose by at least 40 pips. However, German Chancellor Angela Merkel later rejected calls to increase the cap on the EFSF budget, which weighed on the euro. By the end of the day, EUR/USD closed 160 pips down from its open price. 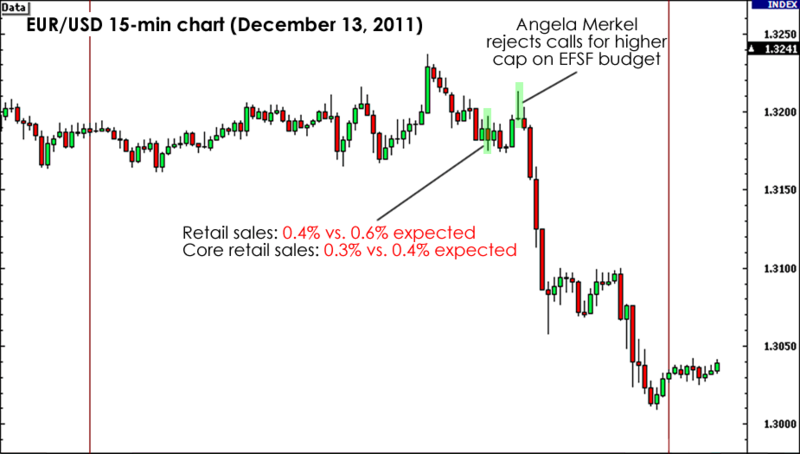 In our next chart we can also see how December’s figures disappointed expectations. Released last January 12, the headline figure came in at 0.1% instead of the expected 0.3% growth, and the core figure slipped by 0.2% instead of rising by 0.3%. EUR/USD fell by 25 pips within the first 15-minute candle following the release but the pair quickly reversed by as much as 100 pips. Aside from the negative figures, ECB head honcho Mario Draghi‘s remarks might have also fueled the dollar sell-off. He said that the euro zone economy might be starting to stabilize and that the central bank’s recent efforts have been working. This time EUR/USD ended the day 120 pips higher from its open price. If the actual figures miss expectations tomorrow, then we might just see EUR/USD continue its uptrend. On the other hand, a positive retail sales report may spark some dollar-buying as it would give the Fed one reason not to pull the trigger on QE3. However, as I have pointed out, the report has a tendency to be outclassed by bigger announcements from the euro zone. This means that the pair’s initial reaction to the figures within the first few minutes of its release might not last so don’t let your guard down. Be sure to gauge market sentiment, ayt? 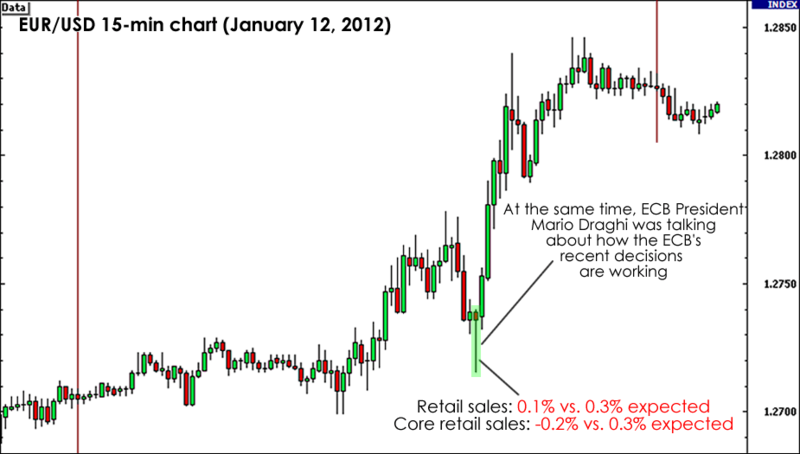 What do you think will be the effect of the U.S. retail sales report on the dollar?